On this cooling & hungry day, where astrologers commented that the moon is supposed to be biggest in 20 years, I decided to go Ming Tien food court to try out a variety of food. Previously I did try the apom which though may not be as tasty as apom guan in Penang but is still good & suffice in PJ/KL. This round, I tried the affordable claypot pork porridge at RM 4, pork chop cheese baked rice at RM 6, tandoori chicken with garlic naan at RM 8 & since I have been craving for oyster omellete, a plate of it too at a reasonable RM 7. Sadly, in my previous quest 2 weeks ago to find some favourite local haunts of oh chien or orh chien, stalls at Tea Time Restaurant at Taman Mayang & Restoran Mei Keng at same row as Ah Wah hokkien mee in Section 14 seemed to have ceased operations. 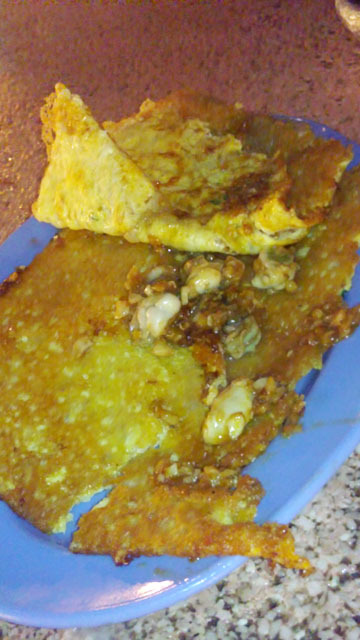 The oh chien here is somewhat the KL type which the batter is made crispy & lots of garlic is put making it very tasty. The oysters are average in size & quite raw but fresh. However, the same cannot be said of the pork porridge which is very plain & almost no pork in it. The porridge was a bit burnt too & not much other ingredients in it. 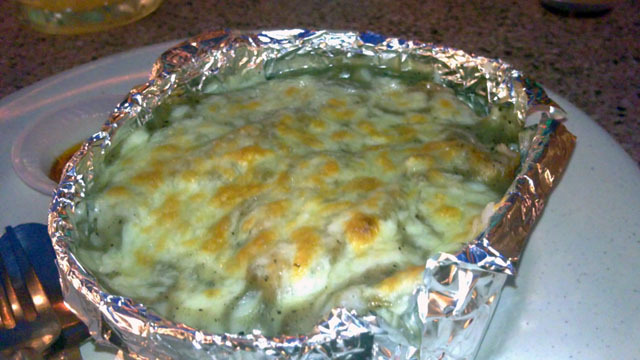 The pork chop cheese baked rice was not too bad & had a unique concoction with black pepper saucebut do not expect Kim Gary’s standards. The Tandoori chicken which on its own is RM 5.50 was tasty & juicy is something to go for too as I noticed unlike many mamaks, this one almost prepares it fresh as there were only 2 cooked chickens but the rest was still raw. The naan was abit plain & lack garlic taste. To top it off, I ordered a medium sized juice at RM 3.60, the jumbo goes for RM 4.80 which seems to be the cheapest I know off. This place is not only an inflation buster but happening too with large crowds frequenting. On 15 January, 2 other items tried were the oyster mee suah at RM 4, which is abit similar to the Shihlin Taiwan Street Snacks with the addition of parsely which unfortunately I hated & some dried squid. The oysters were equally as big & taste almost as tasty as in Shihlin. The gravy was however less starchy which became watery pretty fast. The breakfast set at RM 5 from the western food stall on the other hand was ordinary. 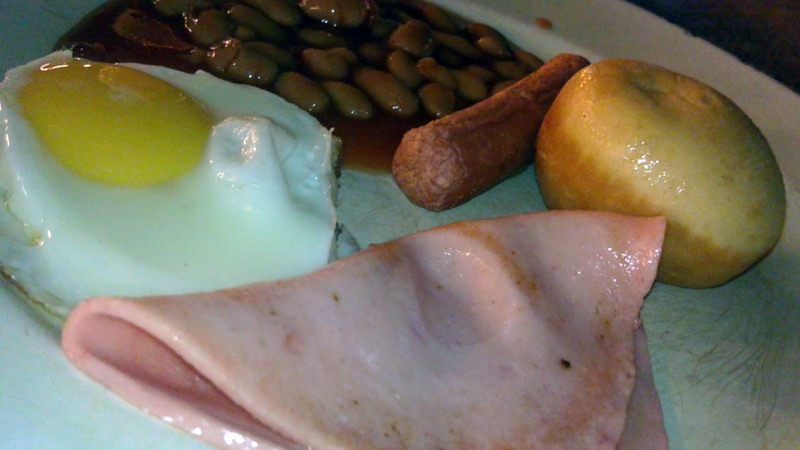 It came with beans, skinny artificial sausage, ham, bulls eye egg & something different which is the fried bread. There is another branch in Sunway too & surprisingly, they even have a web site! 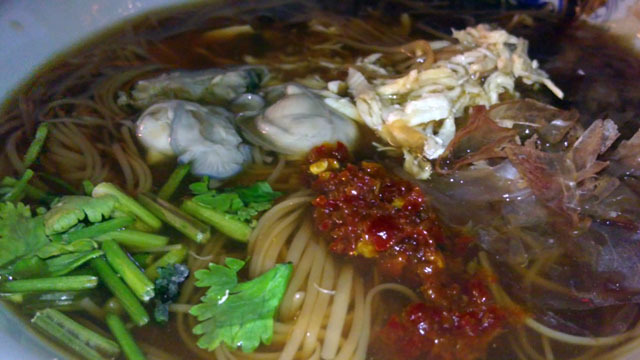 This entry was posted on Monday, March 21st, 2011 at 12:14 am	and is filed under Food Courts, Heavenly Klang Valley Food. You can follow any responses to this entry through the RSS 2.0 feed. You can leave a response, or trackback from your own site.